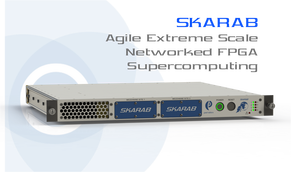 SKARAB is an extremely scalable, energy-efficient, network-attached FPGA supercomputing platform. 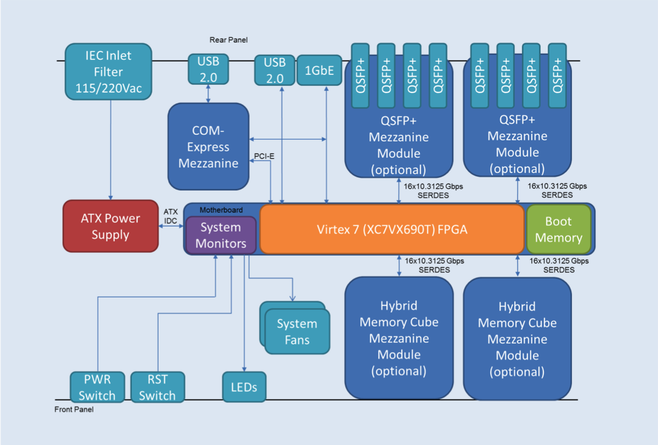 Its motherboard, featuring a Xilinx Virtex 7, provides unparalleled I/O bandwidth via custom mezzanine sites. An advanced reconfiguration interface allows sub-second image loads to the FPGA, enabling compute clusters to rapidly change function with minimal down-time. Four symmetrical mezzanine sites provide flexibility for optimally balancing 40 GbE I/O, Hybrid Memory Cube and ADC configurations. 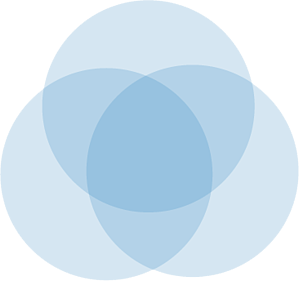 Users can take full advantage of the platform’s features using a rich board support software and firmware package, allowing rapid customization to a specific application. 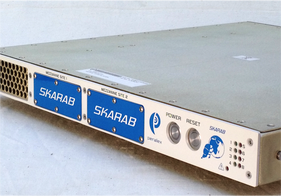 SKARAB is a creation of Peralex Electronics, a world-class developer of advanced signal processing solutions for defense and civilian applications such as electronic warfare and radio astronomy, located near Cape Town, South Africa. Unique architecture supports extreme I/O with real-time processing at Terabit/sec rates while having great reconfigurability and SWAP efficiencies. Over-designed for datacenter operations, commercially available maintenance parts mean that the platform can perform for years of continuous use. Hundreds of SKARABs perform the FX correlation calculations of the MeerKAT 64-dish radio telescope in real-time, processing near petabyte/sec data rates.